Columbia University Press, 9780231188401, 480pp. 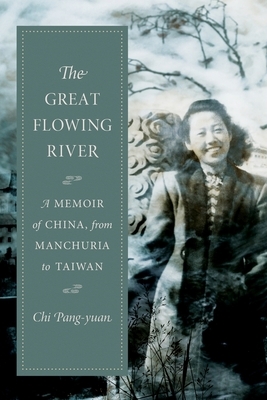 Heralded as a literary masterpiece and a best-seller in the Chinese-speaking world, The Great Flowing River is a personal account of the history of modern China and Taiwan unlike any other. In this eloquent autobiography, the noted scholar, writer, and teacher Chi Pang-yuan recounts her youth in mainland China and adulthood in Taiwan. Chi's remarkable life, told in rich and striking detail, humanizes the eventful and turbulent times in which she lived. The Great Flowing River begins as a coming-of-age story set against the backdrop of China's war with Japan. Chi depicts life in pre-occupation Manchuria and gives an eyewitness account of life in China during the war with Japan. She tells the tale of her youthful romance with a dashing pilot that ends tragically when he is shot down in the last days of the war. The book describes the deepening political divide in China and her choice to take a job in Taiwan, where she would remain after the Communist victory. Chi details her growth as an educator, scholar, and promoter of Chinese literature in translation and her realization that despite her roots in China, she has found a home in Taiwan, giving an immersive account of the postwar history of Taiwan from a mainlander's perspective. A novelistic, epoch-defining narrative, The Great Flowing River unites the personal and intimate with the grand sweep of history. Chi Pang-yuan (b. 1924) is an internationally recognized educator, scholar, and author. She is professor emeritus of English and comparative literature at National Taiwan University. She is coeditor of Chinese Literature in the Second Half of a Modern Century: A Critical Survey (2000) and The Last of the Whampoa Breed: Stories of the Chinese Diaspora (Columbia, 2003), among other books. John Balcom teaches at the Middlebury Institute of International Studies at Monterey. His Columbia University Press translations include Cao Naiqian's There's Nothing I Can Do When I Think of You Late at Night (2009); Huang Fan's Zero and Other Fictions (2011); and Yang Mu's Memories of Mount Qilai: The Education of a Young Poet (2015).